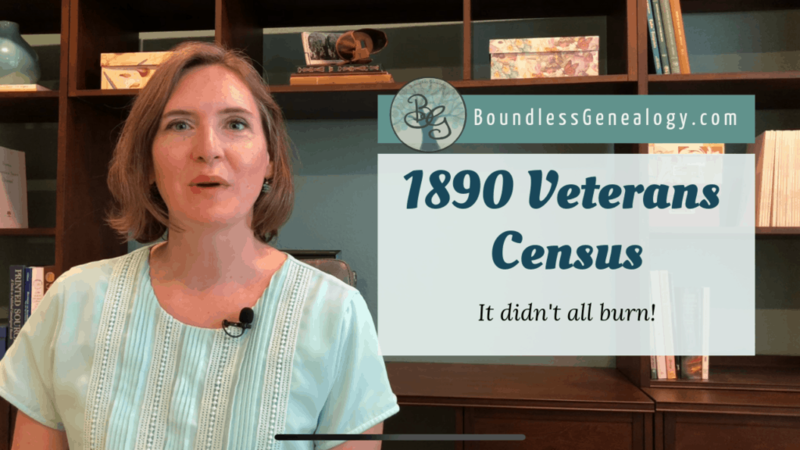 Every genealogist wishes the 1890 US Federal Census still existed! But, thankfully part of the 1890 Veteran’s Schedule still survives… and if you have found your ancestor in it, it can tell you a lot! Let’s examine the details right now. The US government has taken a census, or count, of the people living in the country, every 10 years since 1790. As genealogist, this is one of the first records we go to to get a snapshot of our ancestor’s family structure every 10 years. However, the 1890 census was damaged by the Commerce Department Building Fire in 1921. Only a few fragments of the population schedule remain. But, the US Pension office asked for a special enumeration of Civil War Union Veterans during the 1890 Census in part to determine how many veterans and their widows remained and would need pensions from the US government, although Confederate soldiers, as well as veterans from other wars made it onto the census. A good portion of this schedule was also destroyed before it was moved to the National Archives. Alabama through Kansas and half of Kentucky have only fragments left, but the other half of Kentucky through the rest of the alphabet remain. These can be found digitally at FamilySearch and at Ancestry. Even though the 1890 population schedule no longer exists, the first two columns of each entry on the Veterans schedule tells us the house and family that this person belonged to on the main schedule. Unfortunately, we can’t go back to the population census to see the rest of the household, but the household numbers help us to understand a little bit about the structure of the neighborhood. On this page, we can look for consecutive numbers or close numbers. This tells us which servicemen lived near one another and gives us a limited piece of information about that section of the neighborhood and the families that lived there. The next column gives us the name of the surviving soldier, sailor, marine or widow of any of these categories of servicemen. The rest of the columns on this portion of the document cover the men’s service: rank, the company they served in, regiment or vessel, the date of enlistment and date of discharge, and the total length of service. Remember to scan the entire document to make sure you don’t miss anything of value. 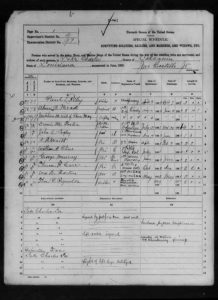 On this Veterans Census, there is a separate section with questions for each man at the bottom of the page. This bottom section asks for the Post Office Address, what disabilities they incurred during their service, and any other remarks the enumerator noted for that entry. Today’s example comes from Louisiana and a veteran listed as Wm C Barton. Let’s dig into the clues that can be found in the 1890 Veteran’s Schedule. In this particular document, the entry of interest was William C Barton, or WC Barton as he was often listed. Thankfully, he was found in entry 10, house 199, family 203. This states that Wm. 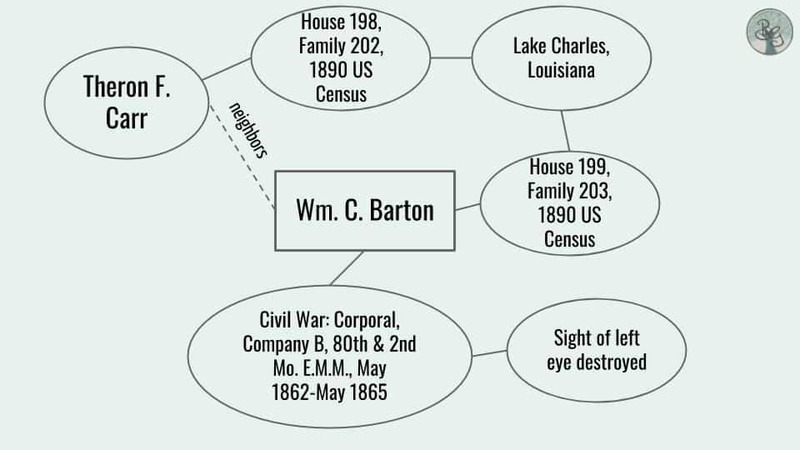 C. Barton was a cor[poral] in company B of the 80th Mo. E.M.M. and the 2 reg Mo. E.M.M. and that he served from May 1862 to May 1865 for a total of 3 years of service. Now, so we don’t miss any clue associated with this entry, let’s follow entry 10 to the bottom section of the page. Wm. C.’s post office is in Lake Charles, La., and his disability is that the sight of his left eye is destroyed. Remember, this document may give you important clues about the friends, neighbors and associates of your ancestor. For our example, Wm.C. Barton, let’s look at the entry just before his. Here we find a man named Theron F. Carr. Theron lives next door to Wm C, if you look at the house and family number. He served in the 2nd regiment of the Minnesota volunteers. Well, he certainly was a neighbor to our person of interest. 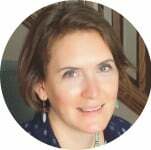 If we are struggling to find enough about our person, we could trace Theron F. Carr a little more to see if his records turn up anything about our person. I happen to know more about these families and their associations from other documents. It turns out that Wm C’s step-daughter married Theron’s son. So there you go! Pay attention to those persons listed nearby in the neighborhood of your ancestor. So, what are some questions this document leaves us with? What is the Mo. E.M.M. exactly? Where and how did the Mo. E.M.M. units serve? Did Wm. C. Barton apply for and receive a pension for his service during the Civil War? How badly was he injured and how much did it affect his quality of life? Where do the clues and questions from this document lead us next? First, we would do a quick Google search for what the Missouri E.M.M. is exactly… and it turns out those initials stand for the Enlisted Missouri Militia. Next, we would do a search for the history of the 80th and 2nd regiments to discover where and when they served in the Civil War and what kind of experience the enlisted men would have had during their service. We would search the United States Civil War and Pension Index, available on most major genealogy research websites for the serviceman, in this case, Wm. C. Barton to see if they or their widow filed for a pension under one of the many pension bills that the legislature passed over the years. 1890 U.S. census, Calcasieu Parish, Louisiana, “Special Schedule: Surviving Soldiers, Sailors, and Marines, and Widows,” Lake Charles, ED 97, p. 1, Wm. 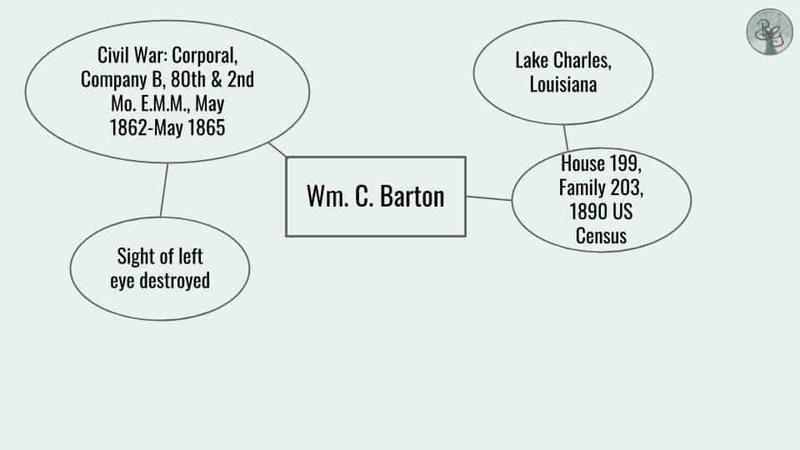 C. Barton; accessed as “United States Census of Union Veterans and Widows of the Civil War, 1890,” images, FamilySearch (https://familysearch.org : accessed 18 March 2019), Louisiana > Calcasieu > image 12 of 16; citing NARA microfilm publication M123, roll 5 (Washington, D.C.: National Archives and Records Administration, n.d.); FHL microfilm 338,164. Subscribe to the Boundless Video Channel! If you enjoyed this video tutorial from the Boundless Video Channel, please subscribe and join me for future episodes.